Internet of Things (IoT) based smart sensors + CMMS empowers Maintenance teams to make smarter and faster decision to fix asset problems and avoid costly asset breakdown. 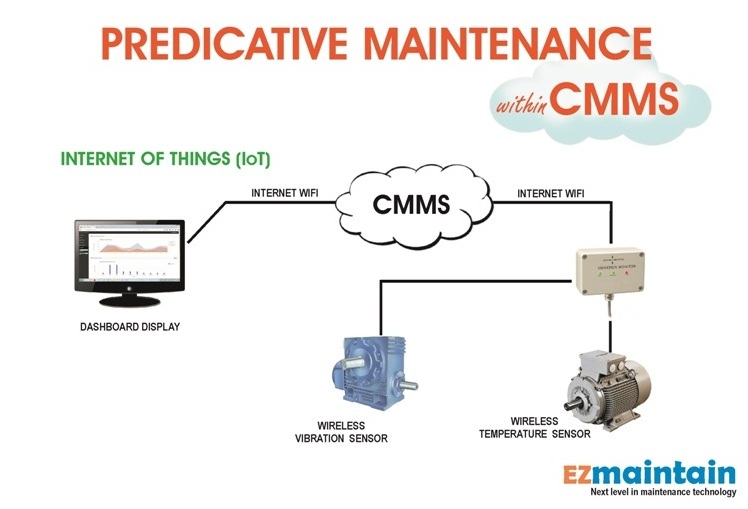 Using WIFI technology EZmaintain offers ready to use Vibration and Temperature monitoring IoT Sensors which provides asset condition via CMMS dashboard, detecting mechanical and electrical abnormalities / alerts allowing maintenance teams to generate work order request for Predictive Maintenance task to avoid asset failure. Our low cost IoT Vibration & Temperature Sensor modules with small foot print and ease of installation allows monitoring of any Pumps, Gear Box, Compressors, Generators or any asset which needs maintenance due to mechanical or electrical wear & tear conditions.